Let it be Magical for Your Momentous Occasions! The heavenly and joyfully hypnotic sound of the harp makes it the right choice for a wedding ceremony. Prelude: 15 to 30 minutes of music performed while your guests arrive, setting the mood for what is to come. Contemporary love songs may be played to create a relaxing atmosphere of expectancy. During the Ceremony: The harp can provide a beautiful aural background during the lighting of the “ Unity Candle”; or a melodic interlude after a reading or prayer, perhaps with a Romantic piece that has special meaning to you. This is the moment everyone has been waiting for . . . You walk down the aisle to meet your future husband and everyone stands up to Honor the Bride, with the accompaniment of bright, angelic sounds, superbly performed and improvised on the harp. Fanny can play as a soloist or accompanied by Bass in a duet or small ensemble. She is a multi instrumentalist and has recently taken the harp to Heart. She is accompanied by her beloved partner, bassist / percussionist and composer Vegari Cendar. Together they provide Jazzy Improvised original music to soothe and delight. Live Art Shows with Vancouver, B.C. artist Micheal Malcom. Music by The Mystiques featuring Fanny Starchild (Harp) and Vegari Cendar (Bass). Featured guestRoss Barrett on Sax. 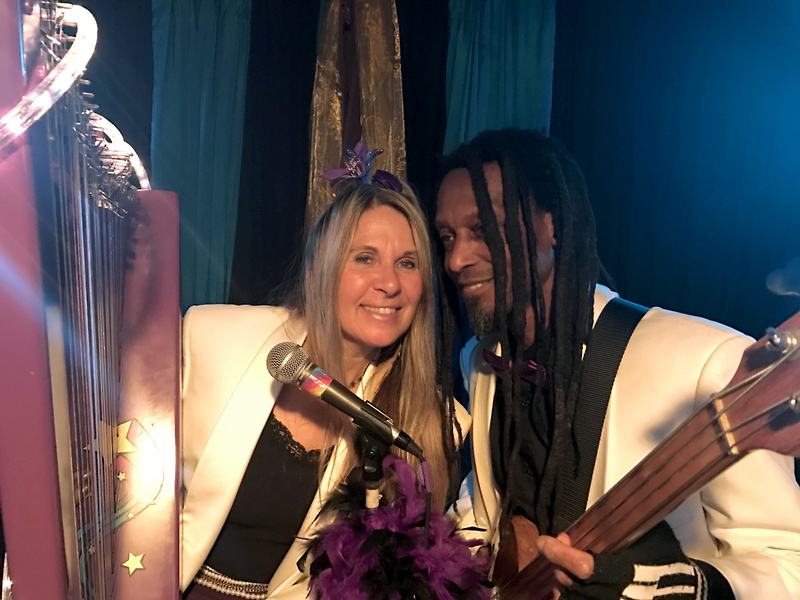 Garden H’Om Party Sept 2018 .. Beautiful Butterfly is a Original Song Created in the Moment with Fanny and Vegari.. the Mystic LOVers. La boheme a la Starchild….in the garden of Heaven….